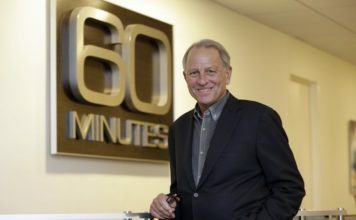 Author: CBS News "60 Minutes"
The internal memo was first tweeted by AirlineGeeks.com, and Allegiant later confirmed to CBS News that it had been sent to employees. “Know we are prepared to fight back against ’60 Minutes,”‘ the memo reads. 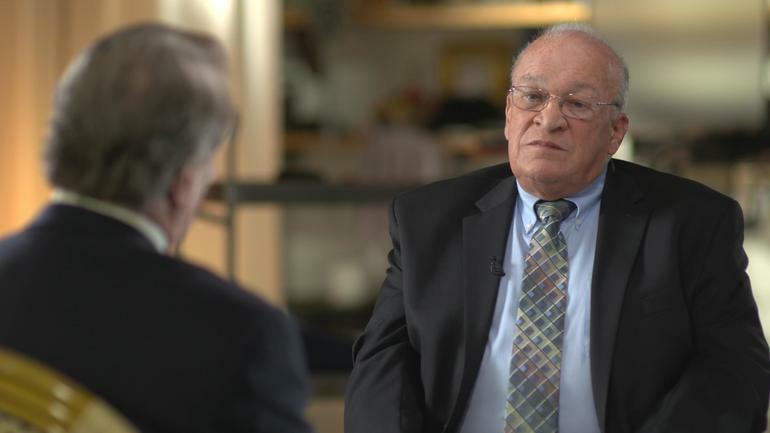 “60 Minutes” correspondent Steve Kroft said in an “Overtime” segment that “60 Minutes” got “no cooperation” from either Allegiant or the FAA in the beginning of reporting the story. But Kinzer’s story is just one of the incidents detailed in the report. “60 Minutes” quoted air safety experts and passengers, and public documents show an alarming number of aborted takeoffs, cases of cabin pressure loss, emergency descents, and unscheduled landings. Allegiant posted a new statement after the segment aired, taking a similar tone to the memo. “Incidents referenced are years old, and took place before our most recent, comprehensive FAA audit. The story breaks no news,” the statement reads. The “60 Minutes” story is not about old incidents: Between Jan. 1, 2016 and the end of Oct. 2017, “60 Minutes” found more than 100 serious mechanical incidents, including mid-air engine failures, smoke and fumes in the cabin, rapid descents, flight control malfunctions, hydraulic leaks and aborted takeoffs. The story highlights how Allegiant’s problems come from the confluence of its aggressive business model and a safety culture aviation experts find to be lagging. Users on social media were shocked by the report. Kroft himself said in the “Overtime” segment that he is “flabbergasted” that not more people know about Allegiant’s safety record. *Story continues below the image. For the past seven months, we have been scrutinizing ‘service difficulty reports’ filed by Allegiant with the FAA. They are official, self-reported records of problems experienced by their aircraft. What we found raised some disturbing questions about the performance of their fleet. Between January 1st, 2016 and the end of last October, we found more than 100 serious mechanical incidents, including mid-air engine failures, smoke and fumes in the cabin, rapid descents, flight control malfunctions, hydraulic leaks and aborted takeoffs. John Goglia: There’s another one, engine fire. We wanted to know what he thought of Allegiant’s 60 unscheduled landings and 46 in-flight emergencies. John Goglia: Very, very high for an airline of this size. I hate to make comparisons– but we’ve seen that before in airlines that are no longer with us that had experienced a number of accidents and killed a bunch of people. I don’t wanna repeat that. So I try to push on Allegiant to– to– clean up their operation. John Goglia: Well, just the service difficulty reports say that– somebody’s not paying attention. Steve Kroft: You’re a former member of the NTSB. 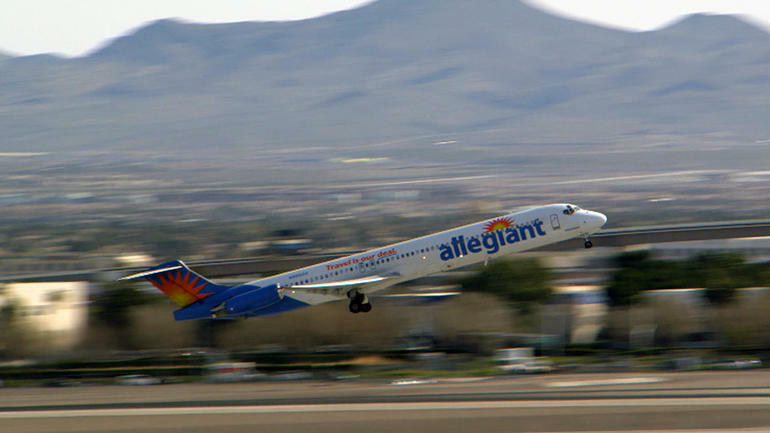 Would you fly on an Allegiant plane? But John Goglia and other aviation experts we talked to aren’t so sure. They believe Allegiant’s problems come from the confluence of its aggressive business model and a safety culture they find to be lagging. The business strategy which has produced 60 straight quarters of profits, occasionally with margins approaching 30 percent, requires the airline to keep costs down and “push the metal” – keep the planes flying as often as possible. But Allegiant’s aged fleet of MD-80s, which it is phasing out and is responsible for most of its problems, require a lot of maintenance and reliable parts are hard to come by. John Goglia: Well, the first and most obvious piece is the lack of infrastructure. They don’t have the number of mechanics. And we’ve seen some problems with the contractors that they’ve used. We’re seeing problems that require– feet on the ground, people looking at the airplanes when they’re being worked on so that these problems are caught during maintenance and not caught by the f– crew as– as a surprise and emergency. Mercedes Weller and Dan Mannheim, who says he paid $80 for his roundtrip ticket to Vegas, remember the pilot’s announcement as they pushed away from the gate three hours behind schedule. Mercedes Weller: He came on and he said, “The mechanics have been working on this right engine. We apologize for that. We’ll get you up in the air as soon as possible.” As we started taxiing, everything was going okay. And then it’s, like, as soon as the wheels came up, the engine blew. Passenger Video: Here we go, we’re taking off. Say blastoff! Oh [expletive]. Mercedes Weller: The force of it was so hard that it– it popped open the cockpit doors. And there was smoke in the cabin and fire coming out of that engine. And I just remember thinking that I would never see my daughter again. Dan Mannheim: Everyone turned their phones back on. And I called my family. And– I pretty much tellin’ ’em goodbyes. 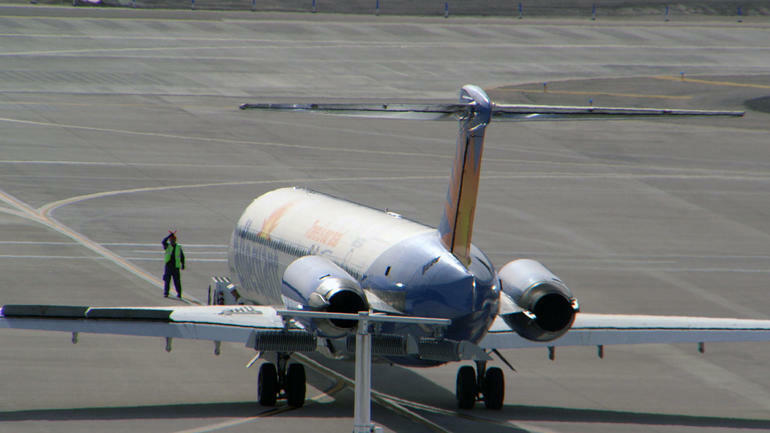 But that was not the only problem Allegiant’s small fleet encountered last July. 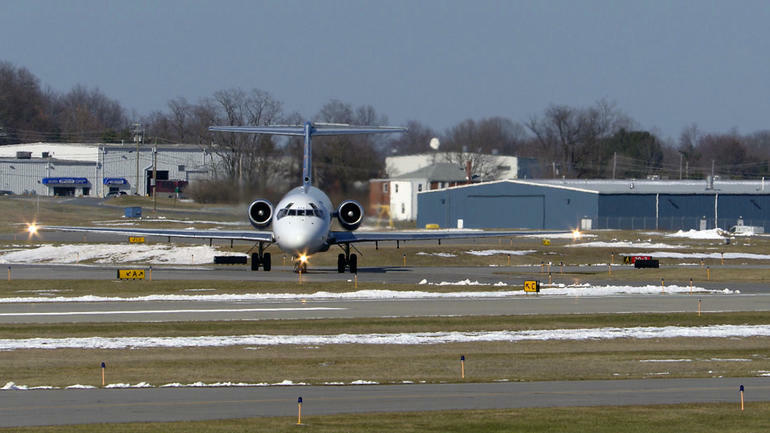 There were nine other Allegiant planes that also had to make unscheduled landings during that month. Four of those planes had engine problems, two reported fumes in the cabin, four had instrument or flight control problems. And that’s not all. Daniel Wells: Well, I– I don’t have all the data in front of me to compare with other airlines. But I can say that those are extraordinarily high numbers. Daniel Wells: Well– (LAUGH) I think that says volumes about the company. I would love to put up some of the– Allegiant pilots. But they can’t. And they can’t because they know that they would be terminated. At the very least, disciplined. And that’s just for speaking up about concerns. So I have to speak on their behalf. Captain Wells says they have every reason to fear retaliation considering what happened to one of Allegiant’s pilots three summers ago. Allegiant 864: We need to return to St. Pete’s. The flight attendants are reporting smoke in the cabin. Rescue Fire: I’m showing some smoke on your number one engine. Allegiant 864: Verify…you’re showing smoke on the number one engine? Allegiant 864: Uh, Tower ground. Allegiant 864 we’re going to be evacuating. It would take another 22 seconds and prompting from ground control before that voice identified himself as ‘Rescue Fire 2’. But, with the clock ticking and confusing radio chatter, Kinzer did what he had been trained to do: he deployed the emergency chutes and evacuated the aircraft, with eight people sustaining mostly minor injuries. Loretta Alkalay: I’ve never ever heard of an airline firing a pilot for an emergency evacuation. Loretta Alkalay has a lot of experience in things like this. She spent 30 years at the FAA prosecuting enforcement cases in the northeast region. She was particularly annoyed by Allegiant’s letter of termination that blamed Kinzer for what it called an “evacuation that was entirely unwarranted” and for not “striving to preserve the company’s assets”. Loretta Alkalay: Yeah, it’s really– it’s really outrageous. And– and that’s where the FAA should have stepped in to look at the safety culture because the message to all the other Allegiant pilots is: don’t ever have an emergency evacuation if you don’t see flames in the cockpit. I mean, that’s– what other message could you get? Loretta Alkalay: I have been told that they never questioned the– the pilot. Steve Kroft: As far as the FAA is concerned, what’s more important: the safety of the passengers or the assets of the airliner? John Duncan: Certainly the safety of the passengers is what’s always important. Steve Kroft: That doesn’t seem to be the values of Allegiant as expressed in this letter of termination. You’ve seen it, right? John Duncan: I’ve seen the letter, yes. But just that letter, and– and nothing else, so I don’t know the rest of the story in that regard. Steve Kroft: So nobody asked you to conduct an investigation so you haven’t? John Duncan: To my knowledge we haven’t been asked to investigate, through a whistleblower complaint, the termination of the captain. Loretta Alkalay: Well, they should have been all over that. I mean, it’s outrageous. What kind of safety culture would allow that to happen. I mean, it’s just so inimical to safety. Allegiant Air is an ultra-low-cost carrier primarily known for its rock-bottom fares and its high profit margins. But what really sets it apart from the competition is that its planes have been nearly three and a half times more likely to have serious in-flight mechanical failures than other U.S. Airlines. That figure comes from a seven-month review we conducted of safety records on file with the Federal Aviation Administration. What’s equally surprising to us is what some have called the FAA’s passive approach to correcting Allegiant’s difficulties. But you wouldn’t know it talking with the FAA. We asked John Duncan, the executive director of flight standards, to comment on the more than one hundred serious mechanical incidents we found at Allegiant in a 22-month period ending last October. Steve Kroft: Multiple engine failures, aborted takeoffs, cabin pressure loss. That’s 100 serious incidents. John Duncan: And we take those very seriously. And we look at each one of them. We look for the root cause, and– and then we address that root cause, and assure that a fix is put in place to make sure that that problem is resolved and doesn’t reoccur. Steve Kroft: And you’re satisfied that all of the problems with Allegiant have been fixed? 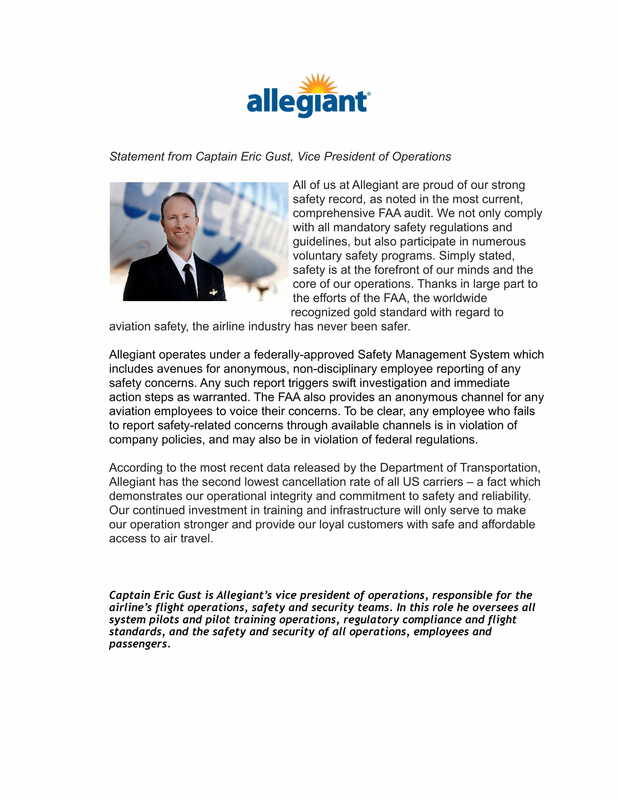 John Duncan: We’re satisfied that– that we are– we are taking the appropriate actions with regard to Allegiant and every other carrier that we work with to make sure that those problems have been– have been appropriately dealt with. Looking at the FAA’s records, you would have to conclude that that is a very optimistic assessment. Go back to August 17, 2015 — around the time the FAA switched priorities from enforcement to compliance – and you can see the differences in their approach. Allegiant Flight 436 was leaving Las Vegas full of passengers when it nearly crashed on takeoff. Barreling down the runway, the pilot had trouble controlling the plane. Running out of asphalt, he made a last-second decision to abort, traveling at 120 knots per hour, barely avoiding disaster. John Goglia: Something inside him said, “I’m not putting this in the air.” And thank God he didn’t, because that was– gonna result in a bad outcome. John Goglia: I mean, this is a critical flight control. So this isn’t– isn’t fixing a coffee maker. This is fixing a critical flight component and obviously, that wasn’t done adequately. According to the detailed report from the FAA investigator, Allegiant and its maintenance contractor, AAR, failed to perform procedures that would have caught the error no less than five times. The report called it “a deliberate and systemic act of non-compliance” that had endangered thousands of passengers on more than 200 subsequent Allegiant flights. Loretta Alkalay: Actually, the file called for a much larger investigation, but the FAA just said– basically letter of correction, which means nothing. Steve Kroft: So, it wasn’t even a slap on the wrist. Loretta Alkalay: Well letters of correction are nothing, they are not enforcement action. There’s no record. I mean, the FAA knows that there’s a letter of correction, but you can’t use it to augment a sanction. They’re just– they’re basically nothing. Steve Kroft: Nothing other than what’s been described to us as not even a slap on the wrist. That was a major screw up, wasn’t it? John Duncan: This was certainly a major event. And– and so our charge in these kinds of events is to assure that they don’t happen again. Steve Kroft: This was three years ago. I mean this was 2015. And we’ve had all these other incidents, these 100 incidents, that have occurred since then. It seems like they’re on top of it? John Duncan: All those incidents have been addressed as I’ve described multiple times. Back in 2015, the only people that seemed to be paying attention to Allegiant were reporters at the Tampa Bay Times. The airline has a major hub in St. Petersburg and the paper began keeping track of Allegiant’s missteps, digging into records and documenting the potential dangers. The coverage prodded the FAA to undertake a thorough review of Allegiant’s operations in April of 2016. Three months later, the FAA concluded there were no serious deficiencies, recertified the airline for five more years and says it has been monitoring ever since without noticing any systemic problems. But last July, while Allegiant was having a very bad month, we decided to follow up where the Tampa Bay Times had left off to see if the airline had improved its operations. We filed a Freedom of Information request with the FAA asking for more than a year’s worth of mechanical interruption summary reports from Allegiant and seven other airlines so we could make a comparison. We received the documents for every airline except Allegiant, which objected to their release. John Goglia: Well, obviously, they have something to hide. And you have– a number of ’em from other airlines, a whole stack from United Airlines. Calls into question why Allegiant is stopping it. You know, is there something there that they don’t want to see? Is there something there that the FAA doesn’t want you to see, either? So that actually points at both of ’em. Six days after this interview, the FAA overruled Allegiant’s objections and produced the documents. They showed, on average, the airline was nearly three and a half times more likely to have mid-air breakdowns than American, United, Delta, JetBlue and Spirit. But even more disturbing are new allegations from the ranks of Allegiant’s own pilots. Their union president, Captain Daniel Wells, says he’s concerned that Allegiant is trying to gain a competitive cost advantage by softening safety standards adhered to by the major airlines. That pilots are being told to think twice before declaring costly emergencies. And that Allegiant’s maintenance department tries to talk pilots out of reporting problems with their aircraft to avoid delays and keep the planes moving. Daniel Wells: What I hear from the Allegiant pilots are– they get– a call from maintenance control, from– who is– an agent of the company and says, “Y– you didn’t write anything up, did you?” Meaning you didn’t notice any maintenance problems on the airplane. And that’s a very clear– message to send to pilots that the company is discouraging you from– recording maintenance deficiencies. 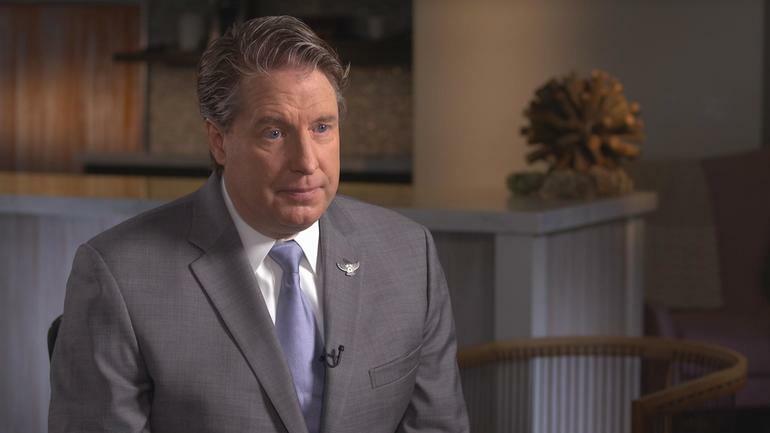 Steve Kroft: The head of the pilots’ union told us that Allegiant’s maintenance operation is discouraging pilots from reporting mechanical difficulties on the flights. Would that alarm you? John Duncan: Certainly discouraging pilots from reporting– legitimate– maintenance problems– would concern me a great deal. Steve Kroft: –aren’t pilots required to report this? John Duncan: They are. It certainly doesn’t meet the safety standards that we would anticipate. John Duncan: It’s something that we do look into on a routine basis. Yes. John Duncan: It’s something we will continue to look into. It must be noted that there has been a sharp drop-off in the number of Allegiant’s service difficulty reports since we notified the airline and the FAA that we were working on this story and began requesting information. It may have to do with the fact that Allegiant replaced ten of its old MD-80s with new aircraft from Airbus. But we do know that this serious incident that occurred in September is not reported in the public record. The oxygen masks in the cabin didn’t deploy and the passengers say minutes went by before the crew moved to get them off the plane. Scott: Yeah. Literally just– breathing this– this white substance. Shanyl: So it’d look normal. Steve Kroft: –aware with the issues involving Allegiant? Loretta Alkalay: No. People believe that if they hold a certificate and they’re flying, they must be safe. The FAA’s on it. Most of the public is also unaware that Allegiant’s CEO Maurice Gallagher was one of the founders of Valujet, another low-cost carrier with the same business model as Allegiant. Valujet never recovered from the crash of one of its planes in the Everglades in may of 1996. Loretta Alkalay, like the former NTSB member, John Goglia, says she would never fly Allegiant. Steve Kroft: Do you know anybody in the industry that– that flies Allegiant? Loretta Alkalay: No. (LONG PAUSE) No. And I know that a lot of people talk about how they don’t fly Allegiant, so it’s very concerning. I know people that worked at the FAA who say they would never fly Allegiant. Steve Kroft: I mean, that’s quite an admission. I mean, this just seems like one of those secrets that everybody knows, and then if you have a plane go down, it’ll all come out.